“I wish we could change the name”, said Dorine after explaining the basics of craniosacral therapy. The audience concurred. A confusing name, they said. 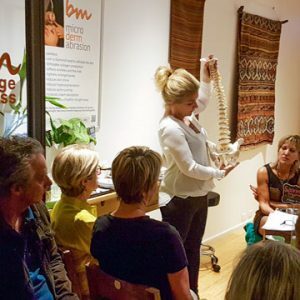 An unfortunate name for a whole body therapy, because craniosacral therapy (CST) can achieve some amazing results on all physical, mental and emotional levels. 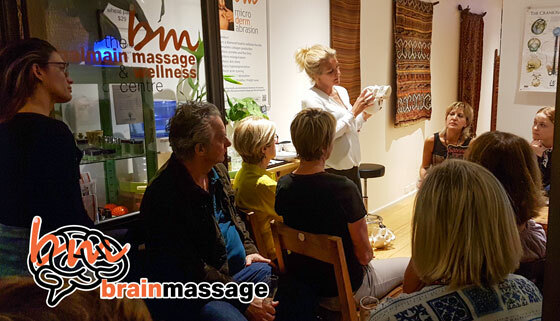 Dorine Siccama is our resident CST therapist, and in the second of our brainmassage series of free events, held Wednesday night 13 September, she was speaking to an attentive audience which included therapists, people who had experienced this form of healing treatment and others who were just curious to know more after seeing the free event promoted in What’s on in Sydney. “Everyone take their pulse”, asked Dorine. “And now listen to your breathing. So, the heartbeat is around 60 to 80 beats per minute, while the breathing rhythm is 18 to 20.” But there’s a third rhythm in the body, explained Dorine, which is much, much slower. That’s the rhythm of the bones, which extends from the skull down through the spine. This is what the therapist feels for in the initial assessment of a patient’s condition, and listens to the information the body transmits. “The body is much more intelligent than we give it credit for,” says Dorine. It works wonders to keep us healthy, to isolate traumas, to heal itself.“It’s a progressive therapy that embraces the latest findings in medical science and the wisdom of traditional healing arts”. It’s far better known and accepted in Europe, especially in the countries to the North. Trauma is definitely something craniosacral therapy can help with, she says. “Experiences that are too overwhelming or traumatic to cope with can remain in your system, locking your body in a fight or flight state. The long term effects of this unresolved trauma can include feelings of dissociation, stress and hyper-alertness, and can lead to illness and disease.” CST works particularly well, Dorine says, by helping body and brain resolve held experiences, but “without the need to revisit the original traumatic incident”, she points out, which could re-open old wounds. Some in the audience recounted their experiences, both as therapists and patients. Everyone felt touched by the plight of a young woman who told of the harrowing memories of nine major operations on her back. It was just so appropriate that she ended up with a gift voucher for a CS treatment that Dorine had kindly made available to be drawn among the event’s audience.